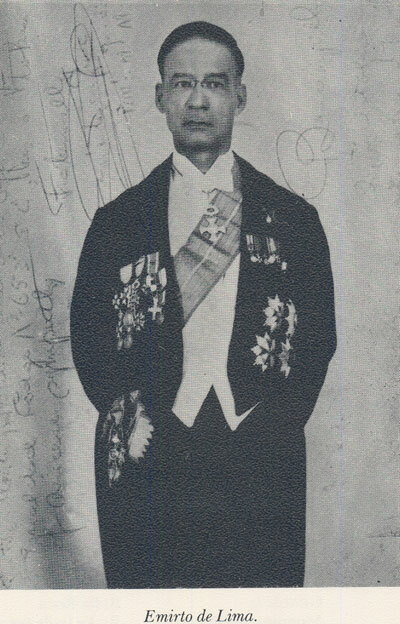 Emirto de Lima y Santiago (1890-1972) was a member of the Order of the Crown of Thorns (in the photograph he wears the miniature insignia, fourth from left on his left breast). He was a Colombian musician and musicologist, studying first with his father in Curaçao, then with Pedrell in Barcelona and finally at the Schola Cantorum de Paris under Vincent d’Indy. He spent time in Ottawa, and from 1929-30 served as a conductor for the new radio station there. He was also involved with the Ottawa Philharmonic Orchestra and as a music critic. He was for a time in charge of his own academy of music, but when this ran into financial difficulties as a result of changes in musical fashions (he was a staunch opponent of jazz) he was appointed consul general in Barranquilla for Liberia and Honduras. The manner of his death was mysterious, with all his possessions, including manuscript scores, being seized by the authorities and not released to this day. He was a dedicated phalerist and member of many chivalric orders. His piano music has been recorded on CD by Harold Martina in a disc supported by the Colombian Ministry of Culture.